In a medium saucepan, bring stock to boiling. Reduce heat to low and cover to keep warm. Meanwhile, in a large saucepan, heat the 2 tablespoons butter and the oil over medium-high heat. Add pancetta; cook and stir about 8 minutes or until nicely browned. Using a slotted spoon, remove pancetta and drain on paper towels, reserving drippings in pan. Reduce heat to medium. Add onion to reserved drippings; cook and stir until onion is tender. Add rice to onion mixture in saucepan; cook and stir over medium heat about 3 minutes or until rice begins to brown. Stir in half of the cooked pancetta. Carefully add wine and crushed red pepper. Stir in corn, cooked wild rice, the 1/2 cup cheese, the 2 tablespoons butter pieces and black pepper. Cook over low heat for 3 minutes, stirring occasionally. Divide risotto among six shallow pasta dishes or bowls. 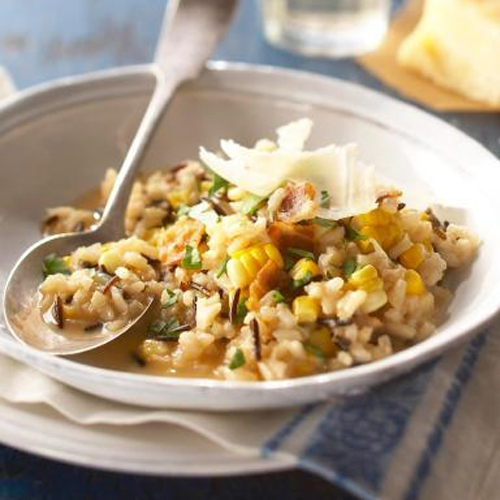 Sprinkle risotto with the remaining cooked pancetta, shaved cheese and parsley. To cook wild rice, rinse 1/2 cup wild rice, lifting the rice with your fingers to clean thoroughly; drain. In a small saucepan, combine wild rice and 1 cup water. Bring to boiling; reduce heat. Cover and simmer about 40 minutes, without stirring, or until rice is tender and most of the liquid is absorbed. If needed, drain. Makes about 1-1/4 cups. 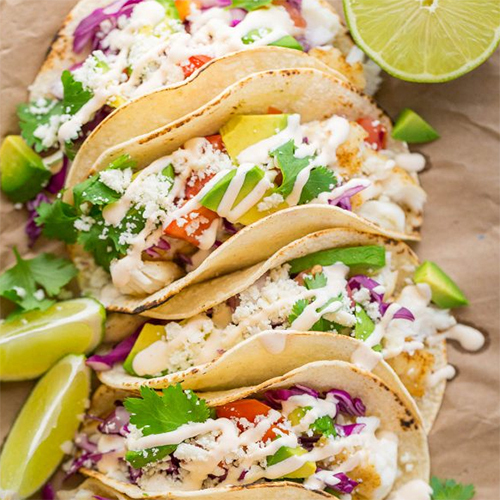 Fish Tacos With Best Ever Taco Sauce! Line large baking sheet with parchment or silicone liner. In a small dish, combine seasonings: 1/2 tsp cumin, 1/2 tsp cayenne pepper, 1 tsp salt and 1/4 tsp black pepper and evenly sprinkle seasoning mix over both sides of fish. Lightly drizzle fish with olive oil and dot each piece with butter. Bake at 180c for 20-25 min. To brown edges, grill for 3-5 minutes at the end if desired. To serve the tacos, toast the corn tortillas quickly on a large dry fry pan or griddle over medium/high heat.